Gobnait Lucey (RIP), Clinical Dental Surgeon in the Southern Health Board and myself. I acted as Chairman and at the time I was Assistant Lecturer in Preventive & Paediatric Dentistry in University Dental School & Hospital, Cork. For 4 years prior to the first meeting I was closely involved with the University of Manchester as I was preparing for my PhD Degree in Dentistry and my supervisors were Chris Collins from Cork and Professor Leslie Harwick of the University of Manchester, Dental School, UK. 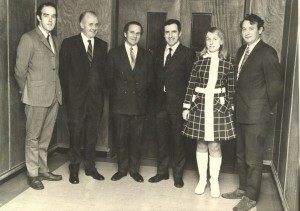 In the course of this work I became friendly with Professor Phil Holloway who was founder member and President of the British Paedodontic Society (in fact the original name of the Irish Society of Dentistry for Children was the Irish Paedodontic Society but its name was changed some years after its foundation, as was the British Society). During these contacts with Professor Holloway the question arose about the setting up of an Irish Society focusing on Science and Art of Dentistry for Children. With that in mind the group named above got together, wrote a constitution and planned the first meeting to be held in October 1971. The choice of speaker was made easy because earlier in 1971 I was invited to make a presentation to the Annual Scientific Meeting of the British Paedodontic Society in Cardiff, the topic being the subject of my PhD thesis; “The Prevalence of Traumatic Injuries to Permanent Incisors and Associated Factors”. Incidently I was conferred with my PhD Degree in June 1971 and I was the first to be awarded a PhD in Dentistry in the National University of Ireland. The president of the British Society at the time was Professor Neill Swallow, Head of the Department of Paediatric Dentistry in the Cardiff Dental School. Neill kindly agreed to be our first speaker. There were gales and heavy rain on the evening of the meeting and the Committee were concerned that our speaker might not make it to Cork on his flight from UK. However, Neill duely arrived and the meeting went ahead. The crowd was bigger than expected and as far as I can recall over 100 attended. The meeting was widely reported in the press. Dr. Chris Collins was also at the time Head of Mallow/Macroom/Mitchelstown caries fluoride studies being run by the Department of Health to monitor the effectiveness of water fluoridation. Chris later became success as a Private Practitioner specialising in Paediatric Dentistry. Vincent Bluett had trained in Oral Surgery in London. Also in September 1966 when I was working in the Southern Health Board (Cork Health Authority at the time) Vincent and I set up the first and only dental clinic on the Island of Cape Clear, as the local publican was the only person with electricity the clinic was established in the local pub. Tim Holland succeeded me in the Department of Paediatric Dentistry in Cork when I moved to the University of Manchester in 1972. Tim went on to undertake further training in Paediatric Dentistry and became a Consultant in Paediatric Dentistry until recently. Gobnait Lucey unfortunately died in a swimming accident in Ardmore strand shortly after the events described above. Chris Collins did his training in Paediatric Dentistry in Manchester Dental School under Phil Holloway. The authors of the standard textbook in Children’s Dentistry in the UK and Ireland in the 70s and early 80s were Phil Holloway and Neill Swallow.